SEASON 1: THE WHOLE ENCHILADA! Ceviche in the Limelight – Ceviche, traditional Mexican lime-marinated seafood with green chiles and tomato: it’s so ancient, so simple. Holy Mole – Rich, complex and shrouded in mystery, red mole is widely regarded as the crowning achievement of Mexican cooking. Three Hot Tamales – Tamales. They’re sold by the steamer-full on street corners and plazas, prepared by the hundreds for parties, eaten out of hand as a morning or evening snack, and universally loved. Pozole – Mexico’s festive pork and hominy stew cooks slowly all day. As the corn and meat simmer, Rick takes us to the ruins of Mitla, where he reveals one of the most ancient and fundamental cooking techniques of Mexico. The word “enchilada” simply means “in chile” and in Mexico, the most beloved version is actually a street snack: a corn tortilla dipped in chile sauce that’s a far cry from the limp, stuffed tortillas swimming in a sea of red sauce and molten cheese that we’re familiar with in the U.S. Rick shows us how to make classic “Street Style” Red Chile Enchiladas at home, and how to transform them into a simple, satisfying brunch presentation, Red Chile Enchiladas with Spicy Potatoes and Fried Eggs. At Sanborn’s in Mexico City, the colorfully tiled restaurant where the famous dish, Enchiladas Suizas, was invented, Rick explains that “Suiza” means Swiss, a tribute to the dish’s use of cream and cheese. This inspires a visit to a Mexican creamery stall, a lesson in making homemade “crema,” the Mexican version of crème fraîche, and a third dish, Rick’s own Creamy Enchiladas with Chicken, Tomatoes and Green Chile. Gleefully dispelling the notion that tacos are crispy shells jammed with ground beef and shredded lettuce, Rick takes us on a journey in search of the real thing. First stop: a taco restaurant in Mexico City where tacos a la plancha–soft tortillas with fillings hot off the iron griddle–are sold. Great tacos need great salsa, and Rick shows us how to make Salsa Verde from both raw and roasted tomatillos in a deadpan side-by-side “dueling salsas” showdown. In Mexico, a butcher butterflies a pork loin with finesse. Rick, back in his Chicago kitchen, launches into his own demonstration of Pork Tacos a la Plancha. Then we’re back to a lively Mexico City taqueria specializing in tacos al carbon filled with charcoal grilled meats and onions. Rick makes two versions of his own–Tacos with Skirt Steak and Portobello Mushrooms–on his backyard grill, along with a traditional molcajete salsa made from ingredients roasted right on the grill. It’s tacos top to bottom, and there’s not a crispy shell in sight. Accompanied by his 8-year-old daughter, Lanie, Rick pays homage to the magic of melted cheese. On a visit to Oaxaca, Rick and Lanie get a firsthand lesson in the art of hand-pulled string cheese. No one can resist a nice grilled cheese sandwich, and Mexicans are no exception–only they call their version a quesadilla. Back home in Chicago, father and daughter whip up some simple Mushroom Quesadillas using store-bought tortillas–they’re easy as child’s play. Returning to Oaxaca, they watch Señora Oliva, for some the “World’s Best Quesadilla Maker,” turn out quesadillas made from fresh masa on a comal over a wood-fire. Can they replicate them at home? Of course! In his back yard Rick gathers nasturtiums, squash blossoms, epazote and poblano chiles, then shows Lanie the fine points of turning masa into Squash Blossom Quesadillas on the griddle. The show ends with a little fun and a little fondue, Mexican-style, as Rick and Lanie prepare the ultimate cheese-lover’s dish, Queso Fundido with Mexican Sausage and Roasted Peppers. Every culture has its small bites–sushi, dim sum, tapas, mezze. But in Mexico, these flavorful tidbits fall into a different kind of category: “antojitos,” the foods you crave. These are the snacks and street foods, as well as the special-occasion treats, that Mexicans love best–the stuff that comforts the soul and sets the heart racing. And the ones made with masa top the charts. Sopes, little masa shells, are baked on a griddle and finished with all kinds of flavorful toppings. We watch them being made in a courtyard restaurant in Mexico as Rick gives the “play-by-play,” then wander into the Uriarte pottery factory, where Rick indulges in his secret addiction: buying dishes. Back in his home kitchen, he makes Potato Sopes with Salsa, Goat Cheese and Fresh Herbs–perfect as an appetizer or party food. Then it’s back to Mexico for a lesson in gorditas–fried masa “pockets” stuffed with savory fillings. Bouncing effortlessly back to Chicago, Rick creates his own version: Bacon Gorditas with Roasted Poblano Guacamole. Homey tacos de cazuela–soft corn tortillas rolled around fillings simmered slowly in earthenware pots–are the soul of Mexican comfort food. And nothing makes them more appealing than just-baked tortillas, fragrant with the earthy aroma of freshly ground masa. How field corn is dried and transformed into the daily bread of Mexico is a remarkable, centuries-old story, and Rick tells that story, taking us on a “field trip” from market to tortilla factory, and finally to his own kitchen, where he shares the secrets of mixing, pressing, flipping and griddling perfect Homemade Tortillas made from fresh masa. To make great tacos de cazuela, it helps to have a cazuela, or earthenware cooking vessel. Rick picks one out in the Oaxaca market, then at home, he prepares two classics: Guajillo-Spiked Pork and Potato Tacos and Mexican-Style Zucchini Tacos. 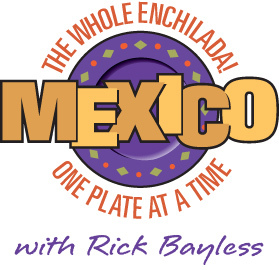 The show ends with Rick improvising the ultimate Bayless late-night snack–Chipotle Chicken Salad Tacos–prepared and eaten by the light of the fridge. Who’s that guy walking towards us through the heat on a Mexican beach? It’s Rick, and he’s about to prove a tasty point about ceviche, the traditional Mexican seafood salad marinated in lime and chiles: it’s so ancient, so elemental and so easy, you don’t even need a kitchen to make it. And so saying, Rick prepares Classic Ceviche right on the beach, using nothing more than a lime to “cook” the fish. For a traditional accompaniment, we go to Chicago for a quick lesson in the art of making Tostadas, crispy fresh tortilla chips. Then it’s a Shrimp Ceviche Cocktail that starts with Rick’s foolproof shrimp steaming technique, plus a visit to a seafood “cocteleria” stand in Mexico to see how the original “stirred not shaken” version is made. Back in his kitchen, Rick creates a thoroughly modern Salmon Ceviche steeped in orange juice and roasted chiles. The tomatillo. It’s the source of much of the distinctive flavor of Mexican cooking. And also the source of much confusion. Rick takes us out to the garden to discover just what a tomatillo is and isn’t (hint–it’s not very closely related to a tomato), with tips on how to grow tomatillos, what to look for when buying them and how to judge their ripeness. He then makes a tangy Tomatillo Salsa Verde with onions, roasted garlic and serrano chiles that’s great with tortilla chips. In the free-associative spirit of the series, those corn chips inspire a delightful side trip to Mexico for a look at the role of corn in the culture and the garden. Back in Chicago, Rick turns roasted tomatillos into a sauce for a juicy Tomatillo-Braised Pork Loin and combines the elemental flavors of corn and tomatillos in a whimsical invention of his own, called Pescado Encornflecado–fried fish filets in a corn flake crust, served in a lively tomatillo sauce with sautéed fresh corn Esquites. Fruit is everywhere in Mexico–sweet, colorful and refreshing. And it’s sold ripe, so the lush smell of tropical fruit is always in the air. We find Rick watching the famous Pineapple dance, in which the dancers shower the audience with fruit–a symbolic sharing of the riches of their village that says a lot about the role of fruit in Mexican culture. At home, he shows us his simple technique for making a quick, refreshing Mango, Jicama and Cucumber Saladthat’s often served as a street snack. He prepares his version of the traditional Mango Agua Fresca, or “Mango-ade” tinged with crimson prickly pear juice. His daughter, Lanie, looks on, then carries the vat of agua fresca off triumphantly to sell at her lemonade stand! Then we’re off to Oaxaca for quick stop at the renowned Chaguita ice cream stand where you can find every imaginable ice cream flavor and a few you’d rather not imagine (pork rind?!). Back in his kitchen, Rick prepares an easy Mango Ice–rich and creamy but dairy-free–and a spectacular finale: Mango Flameado a gratin of sliced mangos, dramatically flambéed with tequila. Rice turns up everywhere in Mexico: as the second course in a traditional midday comida, beautifully molded into a little mound to accompany seafood, heaped onto a plate in a market fonda. But it wasn’t always this way. Rick traces the history of this relative newcomer to the Mexican diet that arrived with the conquistadors by way of Asia and the Middle East. He gives us a step-by-step introduction to making perfect, fluffy Red Tomato Rice as well as a traditional Mexican Rice Pudding garnished with a Piloncillo Syrup made with raw sugar and orange zest. Rice smoothies anyone? In Mexico, Horchata, the creamy cold drink made from sweetened pulverized rice is a much-loved refresher. Rick shows us his technique for making a “blenderized” version it at home and gives us a taste of the genuine article at Oaxaca’s famous Casilda horchata stall. And speaking of beverages, he ends the show with a look at Mexican beer–some of which is made from–you guessed it–rice. Every culture has its soothing, soulful soup, and in Mexico, it’s Caldo de Pollo, a light chicken broth flavored with aromatic vegetables and herbs. To show us how the traditional Caldo de Pollo Ranchero is made, Rick goes straight to the source, shopping for chicken, vegetables and herbs in Oaxaca, then brings it all home to the rustic country kitchen of his friend Suzanna Trilling, where they are joined by Doña Carlotta for a side-by-side afternoon of soup-making and camaraderie. Then it’s back home to Chicago for something a little less traditional: soup on the grill! Rick’s contemporary Spicy Grilled Chicken Soup with Summer Vegetables makes an easy one-pot dinner. We visit a Mexican bakery for a look at the role of rolls and bread in Mexico; then Rick turns the country’s true daily bread, the tortilla, into a tomato-y Tortilla Soup, seasoned with pasilla chiles and epazote and garnished with avocado, queso fresco and a crowning tangle of crispy tortilla strips. When it comes to Chiles Rellenos, Frontera Grill is famous for selling out. Within 20 minutes, the lucky customers who lined up an hour before the doors opened snap up every order. What makes these stuffed chiles in a golden soufflé batter so special? Rick takes us into the Frontera kitchen to show us firsthand. Then it’s a lesson in “chile anatomy” that takes us from a Mexican market stall to Rick’s backyard garden to bring home the idea that in Mexican cooking, chiles aren’t just about heat. They’re thought of as a vegetable–a vegetable that’s perfect for stuffing. Rick shows us how to make classic Pork-Stuffed Chiles in Tomato Broth, as well as his own contemporary variation: Stuffed Chiles Baked with Tomato and Cream. Along the way, we discover all kinds of chiles rellenos in Mexico in this half-hour stuffed with surprises. Rick takes us to the Gulf Coast port of Veracruz, “The Mexican Mediterranean,” for a look at the city’s most famous contribution to Mexican cooking, a fittingly Mediterranean fish preparation known simply as “a la Veracruzana” that features a whole fish baked in a tangy tomato, herb, olive and caper sauce. Inspired by this classic dish, Rick explores the Mediterranean roots of Mexican cooking, and the surprising contributions of Mexico–such as the tomato–to the cuisines of Europe. 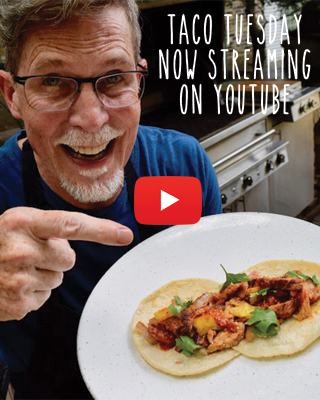 He shows us how to make a dramatic Pescado a la Veracruzana, using a whole fish, then moves to his outdoor kitchen for an easy, contemporary Grilled Salmon a la Veracruzana–tasty proof that Mexican cooking can be every bit as light and fresh as the Mediterranean dishes we’re all so in love with today. Chiles are the hot, spicy peppers that are used solely to make Mexican food so incendiary, right? Wrong. Starting with a trip to a chile stall in Mexico City’s Merced Market, Rick deftly debunks the most common myths about the role of chiles in Mexican cooking. We learn that like grapes and raisins, chiles all get completely new names when they go from fresh to dried. They are, Rick tells us, a vegetable, a spice and most importantly, a flavor ingredient. And nowhere is the flavor of the dried chile celebrated more deliciously than in the famous preparation, Adobo. Rick makes a juicy Chicken in Adobo, roasted in a purée of ancho chiles, garlic and oregano. On a visit to the beautiful San Angel restaurant, a former hacienda in the Mexican countryside, he checks out the pork in adobo and another surprising Mexican invention, Caesar salad. And back in his kitchen, he shows us two more simple, yet spectacularly flavorful uses for his adobo purée: Adobo Roast Duck, and quick and easy Grilled Lamb Chops. “Where did the saying ‘you don’t know beans’ come from?” ponders Rick. “Did you ever think it might be an insult to the bean?” And with that, he begins a half-hour exploration of the deceptively complex and varied world of one of Mexico’s most ubiquitous staple foods. Along a road in Mexico, he tells us about the invisible “bean belt,” a culinary continental divide that separates the light-bean-eating north from the black-bean-eating south. In a Mexican market, he buys an olla–a traditional ceramic bean pot–then takes it home and walks us through the simple steps of making Perfect Beans Three Ways: in the olla, in a modern pot and in a skillet. We learn the real meaning of “refried beans,” and the secret to making them smooth and creamy. At a country home, an artisan cheese-maker shows us how to make Queso Fresco, the crumbling cheese used to top beans throughout Mexico. And back in his kitchen, Rick finishes the show with an inventive twist: Smoky Chipotle Beans with Wilted Spinach & Masa Gnocchi. Now that’s using your bean. Succulent meat, slowly cooked in pits lined with smoldering embers is the stuff of barbecue dreams. Rick takes us for a “pit stop” at Arroyo, the sprawling three thousand-seat outdoor restaurant in the heart of Mexico City, where we see the dramatic all-day pit-cooking process that transforms hundreds of pounds of lamb into succulent “Barbacoa.” At La Capilla, another outdoor family restaurant in Oaxaca, Rick reveals the mysteries of Oaxacan Barbacoa made with chile-marinated lamb buried in a pit. Back in Chicago, he shows us his favorite way to do pit-cooking at home–without lifting a shovel. It’s all done on the grill using indirect heat and Rick’s foolproof leaf-wrapping technique. He prepares fork tenderCochinita Pibil–Yucatecan-style Achiote-Rubbed Pork Cooked in Banana Leaves, served with a fiery Habanero Salsa. It’s one of Rick’s favorite themes: Authentic Mexican food is fresher, more complex, and especially lighter than most Americans realize. Case in point: two classic Mexican preparations, Mojo and Escabeche. Although it’s been a Mexican mainstay since the arrival of the Spanish, Fish in Escabeche is a perfect fit with the kind of light, fresh cooking that’s so popular today. Rick shows us how to make it by steeping crisp fish fillets in a tangy vinaigrette-like sauce made with olive oil, cider vinegar, diced vegetables and pickled jalapeños. In the kitchen of his restaurant, Topolobampo, he shows us a contemporary variation: Grilled Quail in Red Onion Escabeche. If garlic is as good as ten mothers, then Mojo de Ajo–a sauce made from minced garlic, slowly toasted in olive oil–is the mother of all garlic dishes. Rick uses it to make a simple Quick-Fried Shrimp with Sweet Toasty Garlic, and an elegant Roasted Lobster with Mojo Mayonnaise. Along the way, we visit a homemade vinegar stand and a garlic stall in Mexico City’s Merced Market and a restaurant in Veracruz where Rick shows us how to read a Mexican seafood menu. Tamales. They’re sold by the steamer-full on street corners and plazas, prepared by the hundreds for parties, eaten out of hand as a morning or evening snack, and universally loved. And when it comes to rolling your own, making tamales is easier than you think. Rick pays a visit to a streetside tamal vendor, then heads to a tortilla factory to buy fresh masa. Back in the kitchen, he prepares two traditional types of tamales–Green Chile ChickenTamales Wrapped in Corn Husks and Red Chile Pork Tamales Wrapped in Banana Leaves–revealing the secrets of working with masa, filling, wrapping and steaming. The result: a batch of truly hot tamales–beautiful steaming packets that are fun to open and eat–the perfect party food. In Mexico, a tamalada–the tamal-making party-before-the-party can be as much fun as the party itself. Rick joins his friend Carmen Ramirez Delgollado in the kitchen of her Mexico City restaurant, El Bajio, for a “wrap party” and a lesson in making sweet tamales. It’s a total-immersion introduction to seafood stew, as Rick takes us from Chicago’s Maxwell Street Mexican Market to the seafood stalls and restaurants of Veracruz where Rick shops for seafood, giving all kinds of helpful tips along the way. Back in his home kitchen he prepare his own authentic Caldo de Mariscos–a hearty Traditional Seafood Stewsimmered with fresh tomatoes, epazote, arbol chiles and chunks of fresh fish, squid and shrimp. He uses the same soup base to make a contemporary variation: Spicy Grilled Shrimp Stew with Chayote and Potatoes. Gathering lettuces and greens in his garden, Rick talks about the role of salads in Mexican cuisine, then prepares a simple Lime Dressing. Back in Veracruz, he samples a bowlful of Caldo de Siete Mares–Soup of the Seven Seas–at a local seafood restaurant and checks out the traditional dancers whose fluid moves simmer with passion just below the surface like, well, like a brimming bowl of seafood stew! There’s nothing like crispy, warm, homemade tortilla chips, fresh from the fryer. But for those with “fear of frying,” Rick demonstrates his favorite way to make fresh tortilla chips in the oven. Fresh-made chips deserve fresh-made salsa, in this case, a Salsa Molcajete with the zingy flavors of chipotle chiles, roasted garlic and roasted tomatillos, hand-pounded in a traditional lava-rock mortar (molcajete) that Rick picks out in a Mexican market stall. Next it’s a quick way to turn leftover tortilla chips into a satisfying comfort-food dinner: Stovetop Chipotle Chilaquiles–chips simmered with Mexican greens in a tomato-chipotle sauce. Topped with a little shredded chicken, Mexican crema and onions, it ends up looking and tasting a lot like a rustic pasta dish. Using the same sauce as a base, Rick makes an easy casserole-style Baked Chilaquiles enriched with cream, melted cheese and diced ham, perfect for brunch or dinner. Richly complex, shrouded in mystery and misconceptions, Red Mole sauce is widely regarded as the crowning achievement of Mexican cooking and the ultimate mestizo dish–a blend of pre-Columbian and European flavors and techniques that come together in a sauce of remarkable depth and baroque complexity. Its origins are the stuff of myth and magic: convent nuns being visited by midnight visions, enchanted winds blowing through ancient kitchens. It’s a long-simmered sauce perfumed with chiles, nuts, spices and yes, sometimes, though not always, chocolate. No exploration of mole would be complete without a visit to the restaurants, ornately tiled cathedrals and convent kitchens of Puebla, where mole is elevated to the level of a sacred calling. Back in Chicago, Rick takes us into the kitchen and guides us through the intricacies of mole-making, with step-by-step instructions for recreating it at home. There’s a helpful “sidebar” on choosing wines to compliment Mexican food. And the program culminates in a festive dinner with family and friends gathering to enjoy Rick’s traditional Turkey with Red Mole. Mexico is the birthplace of chocolate, and to the Aztecs, it was the original food of the gods. Roasted, ground, and brewed as a hot beverage, cacao beans were imbued with divine properties and traded as currency. Today, when Mexicans talks about chocolate, they’re still talking about a hot beverage–it’s seldom seen in confections and candies. In Oaxaca, one of Mexico’s great chocolate producing centers, Rick shows us how the roasted beans are ground to order, then blended with sugar, cinnamon and almonds to the exacting specifications of each customer. In his home kitchen, Rick shows us how to make a contemporary invention of his own, a Mexican Chocolate Streusel Cake, and whips up a batch of Mexican Hot Chocolate. At El Moro, a beloved chocolate and churros eatery, we watch the process of making Churros, the light, crispy “doughnuts” of Mexico, and head back to the kitchen, where Rick shows us how to make them at home. Pipian Verde, sometimes called Green Mole, is one of the glories of Mexican cooking. A tangy, tomatillo-based sauce, thickened with toasted pumpkin seeds, it’s served with everything from chicken to fish and seafood in the most sophisticated restaurants and the most humble market fondas. Rick takes us to Fonda El Refugio, a famous home-style restaurant in Mexico City’s Zona Rosa, where the five courses of the traditional Mexican meal, or comida, serve as the structural framework of the show. When he arrives at the centerpiece of the meal, Pipian de Pollo, Rick takes us back to Chicago and shows us how to make it. Then, it’s back to the kitchen at Fonda El Refugio, to watch it being served up by the very special kitchen staff–dignified older women who have spent their lives cooking and have earned the honorific title “mayora.” In a country where elders are treated with the greatest respect, these kitchen “sages,” are guardians of the traditional ingredients and the old ways of Mexican cooking. Back in Chicago, Rick pays homage to the new with his ownAlmond Pipian with Fried Shrimp. When the Spanish conquered Mexico in the 16th Century, they brought with them all kinds of foods that the pre-Columbian world had never seen. Among those foods was sugar–and actually, the whole idea of sweets. Standing in the kitchen of the Convent of Santa Rosa in Puebla, Rick tells us that it was the Spanish nuns, in convent kitchens just like this one, who introduced Mexico to confection-making as a way to preserve dairy products. They turned out all kinds of sweets based on eggs, milk and sugar, and among their greatest hits was a rich amber goat’s milk caramel called cajeta. Next stop: the Dulceria de Celaya in Mexico city–a century-old sweet shop where traditional, homemade cajeta lives on. Back home in Chicago, Rick walks us through the process of making Cajeta, then takes us back to Mexico for a brief seminar on cinnamon. His rustic Cajeta Apple Tarts with Fruit Salsa are easy to make and a great way to showcase homemade cajeta. And out at the backyard grill, Rick demonstrates Grilled Pineapple and Plantains–an elegant dessert topped with a scoop of ice cream, some toasted nuts and, of course, a drizzle of warm cajeta. Finally, he pays tribute to the most famous of Mexican desserts that also happens to celebrates the “holy trinity” of eggs, milk and sugar: flan. He shows us how to make his Classic Vanilla Flan, taking a brief time-out mid-way for a trip back to Mexico and a discussion of the origins and mysteries of vanilla. It’s a big day at Casa Bayless–daughter Lanie’s birthday. And that means big fun and big cooking–literally: a backyard full of friends, a homemade cake and an enormous vat ofPozole, the slow-cooked stew of corn and pork that’s Mexico’s number-one party food. Preparing pozole is an all-day affair. And as the corn and meat simmer, Rick takes us to the ruins of Mitla, where he reveals one of the most ancient and fundamental cooking techniques of Mexico: boiling dried corn in calcium hydroxide to make hominy. Later, a demonstration of the traditional Pastel de Tres Leches, or “Three-Milks Cake” inspires a tongue-in-cheek visit to one of Mexico City’s sweetest and least known treasures, the surreal Cake Showroom of Ideal Bakery. Back home, the fiesta comes to smashing conclusion, with piñatas, a mariachi band, laughter, singing and plenty of pozole for everyone.